If you’re in the market for a recreational vehicle, going to an RV show can be an exhilarating experience. All those gleaming brand-new RVs, lined up for your inspection. Each one you walk into has that brand-new RV smell inside. The furniture is beautiful, every surface sparkles… it’s easy to get swept away, as you sit inside, dreaming of your future travel adventures. Well, guess what. The salespeople at these shows know exactly how you feel. And they know exactly how they’ll take advantage of your emotions, too. They know your defenses will be down. They’ll do all they can to make the show a festive event. There might be balloons and music. There might be free popcorn, soft drinks, or hot dogs. There might even be a clown walking around to entertain you. But don’t be deceived. This is a sales event, not a circus or a carnival. And you need to treat it as one. The sales staff certainly will! Remember that the staff is pushed hard at these events. It’s expensive to exhibit at a show, and the dealer will expect each sales rep to make a certain amount of sales to pay for it all. And the reps know that you’ll be a little overwhelmed at all the brand-new coaches lined up for your inspection. They know that you’ll be a little guarded when you enter the first one, but by the time you’ve walked through a few, you’ll be more relaxed. After you’ve walked through a couple of RVs, you’ll even start imagining yourself driving down the road in one of these beauties. And that’s when you’re most vulnerable. You’ve partially sold yourself already –- at that point, all the sales rep needs to do is encourage you as you fantasize, and gently nudge you toward signing on the dotted line. With stars in your eyes, you’ll dreamily buy a brand-new, sparkling RV… and you’ll pay way too much for it. First of all, approach the entire show as a business transaction, because that’s exactly what it is. Save the dreaming for when you’re at home looking at the latest issue of Motorhome or Trailer Life. Second, decide what you want before you go to the show. It’s all too easy to get swept away by the beautiful RVs on display, and make an impulsive purchase that you’ll regret later. Know exactly what you want, and why you want it: the price, size, floorplan, etc. that’s best for you. Third, consider learning from an “insider” how to get a super deal at an RV show. I recently interviewed a former RV dealer (with 35 years in the industry). He told me how to get the RV you want for close to, or even below, dealer cost –- not only at RV shows, but at dealer lots too. You can save tens of thousands if you learn his methods. Incidentally, an important part of this process is the RV financing. You can save tens of thousands here, too, as the former dealer explained to me. 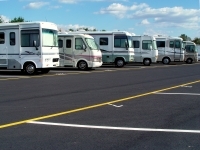 Countless RVs are bought at RV shows each year. And countless RVers overpay by thousands at these shows. But if you prepare properly, you can get a great deal at an RV show. Just one word of warning, though. If you do this right, you’ll save tens of thousands on your RV… but make sure your friends don’t get sick of hearing about it afterwards! Discover how to get the motorhome, fifth wheel, or travel trailer you want at a shockingly low price.